I am asked this question by clients more often than any other question. And, ironically, this is the question that I am probably least able to answer on my own. First, I’ll define the terms. An uncontested divorce means that the parties are in agreement on ALL issues currently confronting them and are willing to enter into a contract of settlement that will end the case on a final basis. A divorce is contested if the parties disagree on any issue (custody, visitation, child support, division of assets, a division of debts, etc.) and need a hearing with a judge to resolve any dispute. Does Your Spouse Want the Divorce as Much as You Do? It’s not uncommon for one person to think that his or her marriage is damaged beyond repair while that person’s spouse thinks everything is just fine or the relationship can be saved. So, at the most basic level of analysis, you both have to agree that divorce is the right way to resolve your marital problems or an uncontested divorce is not possible. Do You Know How to Find Your Spouse? This may sound silly, but this issue arises fairly often. Someone contacts my office about an uncontested divorce and then tells me that he or she hasn’t seen their spouse in months. This is more common when the couple does not share children. However, from a practical standpoint, I can’t send uncontested divorce documents to a litigant I can’t find. So, not only must your spouse feel that divorce is necessary, but we must also be able to locate him or her. How Demanding Are Your Terms of Settlement? Look at the situation from your spouse’s perspective. If you want child support, alimony, a portion of his retirement and you want him to pay all of your credit card bills, then you have to ask yourself, “Why would he agree to this?” The short answer: He probably won’t. Never expect someone to settle for their worst-case scenario. If your terms of the settlement could be seen by your spouse as oppressive or unfair, then your spouse will likely “roll the dice” and go to court. You should certainly seek all of the financial relief that you are entitled to, but it may take contested divorce litigation to get there. Is Your Spouse Willing to Discuss the Terms of an Uncontested Divorce? I have this conversation several times each week. Client: “I need a divorce. I think it will be uncontested.” Me: “Have you discussed everything with your spouse?” Client: “Not really. Every time I bring it up he/she gets mad and leaves the room.” Many people don’t see the disconnect in that situation. This is where the personality of the parties is extremely important. If your spouse is hostile about the divorce, and you can’t even discuss the concept of divorce with your spouse without him/her getting angry, then it’s going to be impossible to complete an uncontested divorce with that person. An uncontested divorce requires both parties to work in good faith with one another. If you can’t even have a civil discussion about the topic of divorce (which many couples cannot), then you are likely looking at a contested divorce. 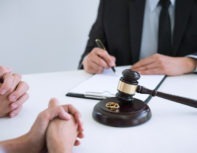 Whether a case is contested or uncontested depends less on the law and more on the personalities involved and the demands being made by the individuals getting divorced. As a general principle, the fewer issues there are, the more likely the case will be uncontested. So, statistically, uncontested divorces are more common among couples who have been married a brief period of time and do not have children. In those situations, we do not have the complicating factors of child custody, visitation, support and complex asset division to deal with. Contact the attorneys at Phillips & Sellers in Columbus, Georgia for your legal questions and find out what other services we offer.